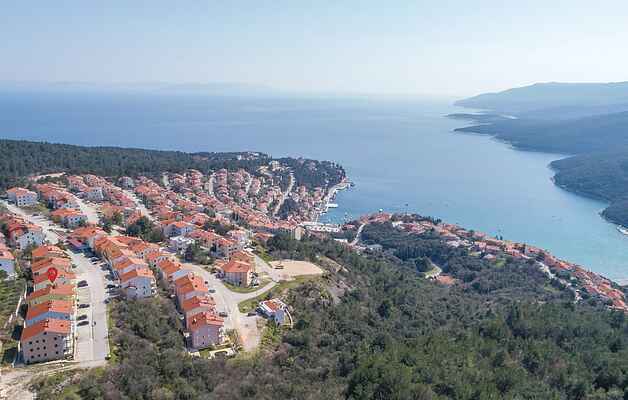 The tastefully furnished holiday apartment with sea view is located in the popular holiday resort Rabac, which is known for its beautiful pebble beaches and crystal clear sea water. The apartment is situated on the second floor of a residential house, on the slopes of the hill and has two bedrooms, bathroom, living room and a balcony, where you can drink your morning coffee. During the day you will have plenty of bathing fun on the beaches and in the evenings, you can taste Istrian specialties in the many bars and restaurants along the promenade. In the neighboring town of Labin, expects you a picturesque old town with lots of small art galleries, as well as a viewpoint with a spectacular view of Rabac Bay and the Kvarner islands.